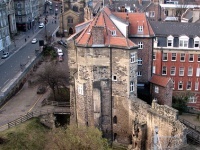 Originally known as Monkchester, Newcastle only got its present name when Robert Curthose, son of the infamous William the Conqueror, built his 'New Castle' on the site of the Roman fort Pons Aeliu in 1080. Used as a point of defence, the castle was originally built of wood and timber, but was later rebuilt in stone. Today, visitors can explore the remains of the castle, as well as the Castle Keep built later on the same site by Henry II. The Castle Keep is acknowledged as one of the finest surviving examples of a Norman Keep in the country.